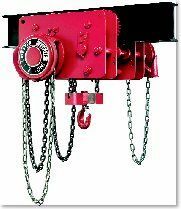 The Chester Zephyr Low Headroom Chain Hoist is designed for very limited head room applications, where other hoists cannot be used. The Low Headroom Hoist is custom built to fit a specific beam and can be built to suite patented tracks, I-Beams, Wide Flange beams or almost any other type of runway. 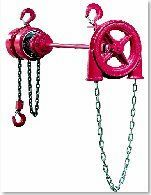 The hoist incorporates a rugged steel frame, suspension members and covers and uses the heavy duty components. Features include our planetary gear train, positive acting Weston Style load brake, alloy steel load chain and a load wheel which can be reversed to double its useful life. The design of the Zephyr Low headroom hoist makes it ideal for customization to meet the specific requirements of most applications. 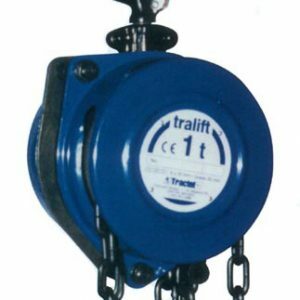 Options include load limiters, chain containers, track clamps and spark and corrosion resistant features. 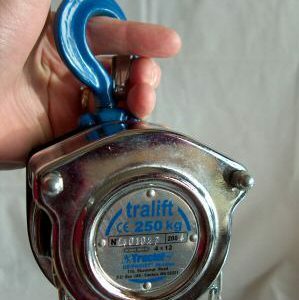 CATALOG NUMBER STD.� LIFT RATED CAPACITY IN SHORT TONS LOAD CHAIN LENGTH 2 CHAINS PER HOIST ** MINIMUM RADIUS CURVE MINIMUM DISTANCE BOTTOM OF I-BEAM TO HOOK IN INCHES CHAIN PULL TO LIFT FULL LOAD LBS. 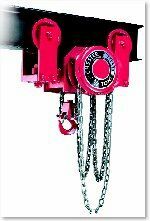 CHAIN OVERHAUL TO LIFT LOAD ONE FOOT �NET WEIGHT,� LBS.